Formerly known as “Chopper Bob,” Tur will make history Tuesday as TV’s first-ever trans correspondent. 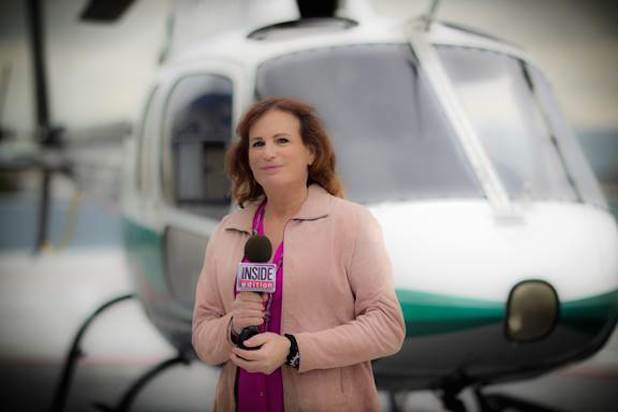 Zoey Tur will make history as the first-ever transgender reporter on national television Tuesday when she joins the “Inside Edition” team as a special correspondent. Formerly known as “Chopper Bob,” Tur made a name for herself as a helicopter pilot who covered the infamous O.J. Simpson police pursuit in 1994 and the Los Angeles riots in 1992. Tur was also credited with saving the lives of 54 people during a freak Southern California storm in January of 1988. A local fire department asked her to pilot her AS-350B Eurocopter through 60-knot winds, at zero visibility, to airlift stranded tourists from 22-foot seas that pounded apart their hotel. Tur has received numerous awards for her heroism. But it’s a different kind of bravery that has now landed her in the national spotlight. TheWrap spoke to Tur about her transition and her history-making return to TV. TheWrap: How did the “Inside Edition” gig come about? When did you first realize you had gender dysphoria? “I knew at a very early age, about 6 years old, that there was something different about me. But being young and not being exposed to people who had gender dysphoria, or role models that you see on TV today, I didn’t know what it was. As I got older, certainly when I hit puberty, I knew exactly what it was … I had strange feelings or thoughts. I knew this was not going away, but I tried to suppress it. When did you decide to finally go through the transition? I took a break from television news because I needed to sort things out. On May 6, 2013, I started hormone replacement therapy and began transitioning. I was very depressed, which is not uncommon for people with gender dysphoria. Two hours after my first estrogen injection, my depression went away for the first time in my life. It was a confirmation that I was doing the right thing. My ex-wife was not pleased. My son was very understanding and my daughter (NBC News Correspondent Katie Tur) took it very hard. You see your father a certain way. Your parents are your parents. She had this very macho heroic father and she learned her father was not only human but suffering from a genetic problem. She’s still has some issues but she’s working on it. I think things are getting better now. Were you worried you might not ever work in TV again? Yes! I love what I do and I’m great at it. I was very afraid. But, because of who I am and what I am, I’ve been thrust into this civil rights battle. It was a very public transition. But, it also made me feel less alone. I was now part of the LGBT community. I had never felt part of anything before. There have been great strides for the community. The president mentioned transgender people in his State of the Union address, and “Transparent” won two Golden Globes this year. It was time for some real diversity. I have to give credit to “Inside Edition” and CBS for coming down on the right side of history. Are you surprised at how big your story has become in the day since the announcement was made? It didn’t surprise me that people were interested. What did surprise me is the quality of questions. People were not only well educated about the issue, they were very understanding. It’s heartening. I read somewhere that some have questioned whether you could still fly a helicopter since your transition. Did that bother you? Not really. To be honest, I questioned it myself. My driving has gotten worse. I dented my front bumper because I ran into something. So, I was wondering whether I’d be a good pilot. I found that I’m actually better at it. I’m more relaxed and my multi-tasking capabilities have grown exponentially. I think women make better pilots. Inside Edition hired you as a special correspondent during the month of February. Is there a chance you might stay on after that? We’ve talked about doing something larger, but I really can’t say at this point. I don’t want to step on anyone’s toes. February 5, 2015 in Interviews.